Copenhagenize.com - Bicycle Urbanism by Design: To Live and Play in L.A.
To Live and Play in L.A. Whenever I come across another indication of how addicted to the automobile that the city I find myself in (Los Angeles) is due to actual written law or policy, I shake my head. Once again I have to acknowledge with disgust just how socially (and traffic-) engineered this place has been so as to prioritize the private automobile in as many aspects of culture and life as possible. The blog Flying Pigeon by bicycle merchant and bike-culture advocate (neither an easy task in these parts) Josef Bray-Ali points out that playing in the street is strictly prohibited in the City of Los Angeles. I recently attended a talk by Dr. Richard Jackson, one of America’s leading experts in how the ‘built environment’, including architecture and urban planning, affect health. In his presentation, Dr. Jackson showed slides of the growing obesity rates in Los Angeles County and described what has happened to our kids health in the past 20 years as “child abuse”. 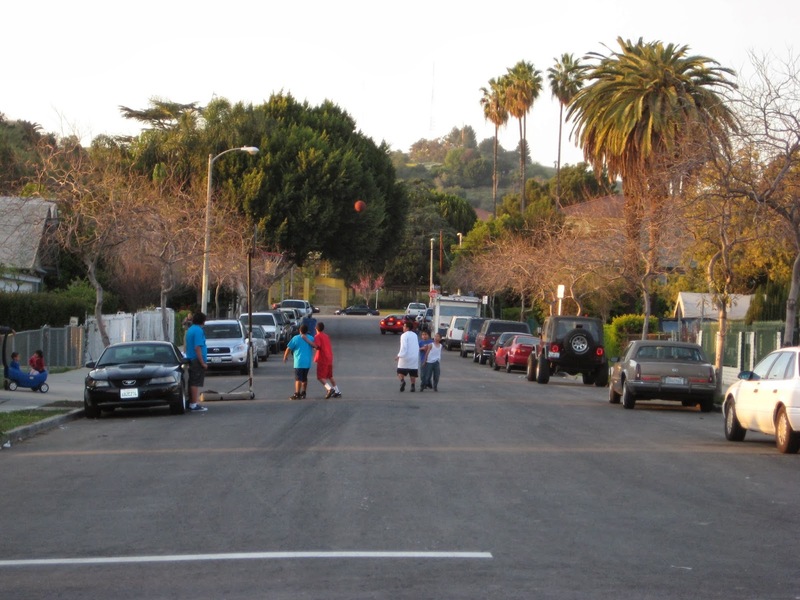 Along with the problems a kid faces these days when she wants to walk or bike around the neighborhood, that same kid faces a wall of cultural and (in Los Angeles) legal limits that prevent the most mundane activities of childhood. Case in point is the law above, Los Angeles Municipal Code 56.16, which makes playing catch on the sidewalk or street an unlawful act. We can have 100 CicLAvias a year but if kicking a soccer ball to your buddy on the sidewalk in front of your apartment building, or throwing a football in the street, is a crime you can expect nothing fundamental to change. The law is clearly aimed at keeping the entire roadway of each and every street, regardless of hierarchy, open so that it may be used for moving or storing cars, plus whatever other vehicles may wish to pass; as long as the motor vehicle ultimately has priority. We call it Ignoring the Bull in Society's China Shop. With the bonus that even most parks are off-limits to, for example, a pick-up game of what the locals call "Soccer"
Just as Mikael wrote about here when discussing Peter Norton's book "Fighting Traffic - The Dawn of the Motor Age in the American City". Except Josef and Richard Jackson are right. This is child abuse. And in a city already suppressing the health of her children through air pollution. Fortunately, the local media has caught wind of the story. To be continued?